“The air was filled with white smoke!” Sgt. Hussein of the Iraqi Federal Police said as the sound of small-arms fire, air strikes and helicopters boomed in the background. 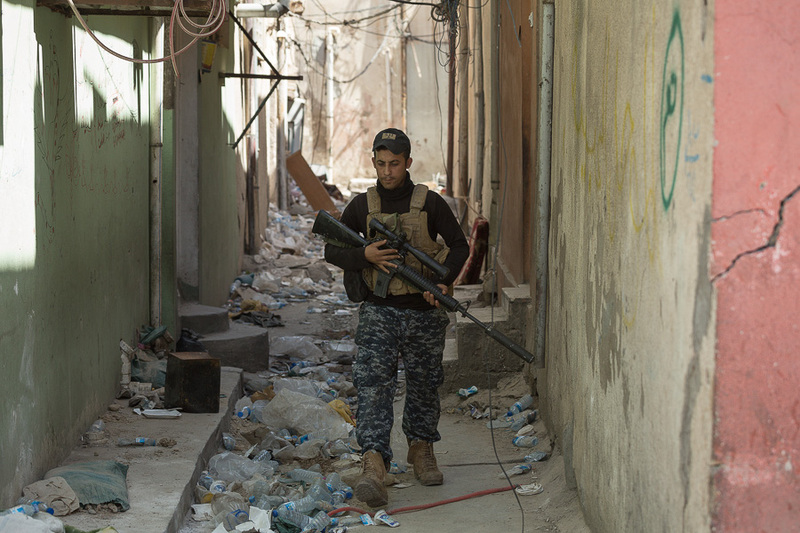 Hussein was one of many Iraqi troops who witnessed the immediate aftermath of the demolition of the ancient Al Nuri Mosque in West Mosul’s Old City. The demolition of the 800-year-old Great Mosque of Al Nuri, and its characteristic leaning minaret, occurred as a combined force of Iraqi troops—the Federal Police, Emergency Response Division, Iraqi Special Operations Forces and elements of the 9th, 15th and 16th Iraqi Army Divisions—closed in on the last bastion of Islamic State resistance in Mosul. The day of destruction, June 22, 2017, was also the holiest day in the Muslim calendar—Laylat Al Qadr, or the Night of Power, the anniversary of the night that the Quran was revealed to the Prophet Muhammad. 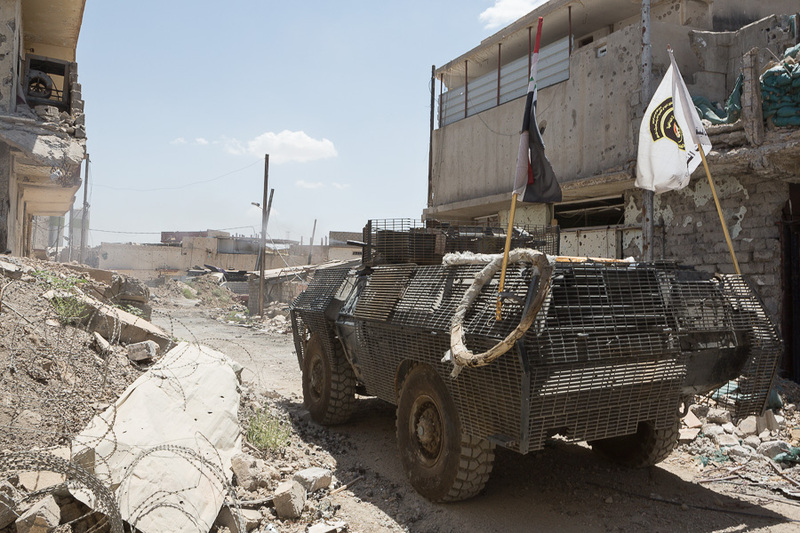 The long-awaited assault on the Islamic State’s holdout in the Old City began in earnest on June 18. This final phase of the Mosul offensive has seen Iraqi troops make slow, but steady, headway into the Old City’s narrow alleys—the only possible approach to such a claustrophobic and complicated urban environment, where troops expect to encounter booby-trapped homes and hidden militant fighters. Maps released by Nineveh Operations Command, the Iraqi headquarters for operations in Mosul and Nineveh province, show that the Iraqi Security Forces were around 200 meters from the mosque when it was destroyed, and some reports put the closest Iraqi troops at just 50 meters away. “It was the biggest explosion I have ever experienced,” another Federal Police sergeant, named Abbas, said. At the time, Abbas was manning a position just behind the front line, around 250 meters southwest of the Old City. He said that he was told by his commanders that Islamic State may have prepared the mosque for demolition. There was not much anyone could do to stop it. Iraqi commanders had said in past interviews that they expected Islamic State to destroy the ancient structure before it could be retaken. If the Iraqis had retaken the mosque, it would have been a hugely symbolic victory—one which Islamic State sought to deny. The Al Nuri mosque was the scene of the only public appearance by Islamic State leader Abu Bakr Al Baghdadi. It was inside the mosque that Baghdadi announced the formation of the caliphate—the so-called Islamic State—in June 2014, around a month after the militant group seized the city. It’s little wonder that militants would try to stop it falling into Iraqi hands. The Iraqi Security Forces also suspect that Islamic State may have used the building as an administrative and command hub in West Mosul. The use of civilian homes and historic buildings as covert munitions factories by the Islamic State has been documented on several occasions. It’s not beyond reasonable doubt that the group would have a command center within the mosque, and it would have provided another reason to deny the building to the Iraqi forces. The destruction of historical sites is typical for Islamic State, which practices an ultra-puritanical brand of Salafi jihadism. In the summer of 2014 the militant group started to demolish ancient structures within its newly captured territory, a move which angered and dismayed historians and archaeologists across the world. One such structure was the Tomb of Jonah in East Mosul. A video released by the group in July 2014 showed the tomb being destroyed with explosives. The group bulldozed the remnants flat and built a tunnel network below the ground. The militants slated Al Nuri for demolition during the same summer of destruction. Reports suggest that Mosul residents objected and even protected the mosque from damage, preventing the militants from carrying out their plans. This time, in June 2017 with the ongoing battle, and any civilians in the area being held by Islamic State as human shields, no one was able to prevent the ancient structure from being raised to the ground. Despite evidence pointing to Islamic State having cause, intent and a lengthy criminal record to implicate it in the mosque’s destruction, the first reaction of the group was to blame Iraq and the coalition in a press release issued by Amaq, Islamic State’s news agency. 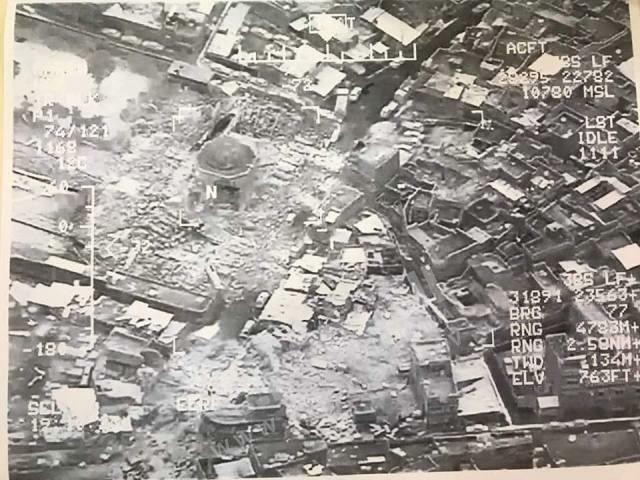 The release stated that the mosque had been hit by a coalition air strike dropped in support of the ISF fighting in the city. The coalition and Iraqis both disputed this. ”We did not strike in that area,” coalition spokesman Col. John Dorrian, U.S. Air Force, said in a statement to Reuters. Iraqi troops who were present at the time of the demolition, and interviewed the next morning, also said no air strikes landed around the time of the mosque’s destruction. Another piece of evidence refutes the I.S. press release. A surveillance video, released to the media by the Iraqi Federal Police, shows a pattern of detonations from within the mosque as it was destroyed. The sequence of detonations, probably linked by a detonating cord, are consistent with a planned demolition—the leaning Al Hadba minaret being first to go, followed by the rest of the building. That would not have taken place if the building was destroyed by an air strike. On the Iraqi side, Lt. Gen. Abdul Ghani Al Assadi, the senior Iraqi Counter-Terrorism Service officer in Mosul, posted a video statement saying that the destruction of the mosque would not stop the ISF from removing the militants from the city. Talking to Iraqi television later, Ghani said that the mosque will be rebuilt. Islamic State will fight to the end in the Old City, and as such will see the destruction of the mosque as a victory—even if it’s just because the group stopped the Iraqi military from capturing it intact.